es…that’s an odd combo. But you can find all three on West 27th Street. I sometimes stay in Nomad at the INNside by Melia. The hotel gives you free water and mini cans of soda and juice in the fridge. A nice touch. Here’s what else you’ll find on the block. 99 Cent Pizza. It’s appropriately called Best & Fresh Pizza and they don’t have a website. (If they did, the pizza would be more than $1.00, I’m sure!) If you give them a dollar they don’t give you back the penny. I guess they would if I asked. No tables…no amenities…just an assembly-line type operation (like a kind version of the Soup Nazi in Seinfeld). People eat huddled in the tiny space, in doorways on the block, or (if you’re a guest at the hotel) in the comfy outdoor lounge area with disco music. 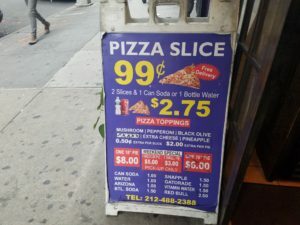 I think toppings are only available at certain hours (not the hours I was there). But the pizza is amazing. Worth the gluten and dairy splurge! You can save some calories by blotting it with a napkin. A classic NY slice. Under Where? Under Here! 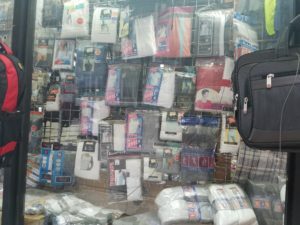 The block is packed with underwear stores. (They seem to sell luggage too, in case you have a Hanes or Fruit of the Loom addiction.) The stores have wholesale signs outside, but I saw individuals shopping inside. I was fascinated but I didn’t go into any of them. I have a decent inventory already. But if you forget your drawers on a bleisure trip, head down to this street for the best selection! Pole Dancing Lessons. I must have upside-down spinning on my mind, having just returned from the Gentlemen’s Club EXPO. 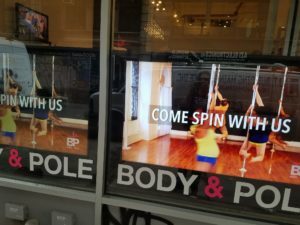 The facility, Body and Pole, has aerial dance fitness classes too and offers group rates. Burn off those pizza calories or have an extra-intimate team bonding experience (NOT advised…your HR department will NOT approve). Of course you’ll find more to explore in this dynamic ‘hood, close to the fashion center, public transportation, and a wide range of interesting restaurants and bars. But these three P’s were too quirky not to share! Bleisure's Best Finds: Who Wants Black Eyes On The Road? Previous PostPrevious Bleisure’s Best Finds: Who Wants Black Eyes On The Road?